Property Size 2,231 sq. ft.
Gorgeous! East Corner Unit! This 4 Bedroom/4 Bath unit is the epitome of luxury! This unit has Crown Molding and Plantation Shutters. The Beach Club is a Destination Resort. The Resort Features a Full Service Spa, Restaurants, Rubico Tennis Courts, 6 pools Fitness Club and Much More! If you have never seen The Beach Club, come see it today! 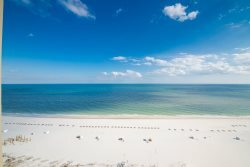 This unit sleeps 10, has sweeping views of the Gulf of Mexico and is truly a "resort" that can't be found elsewhere for miles around. Very friendly and always available if needed. It was a very relaxing stay. There were so many things on site that you never had to leave the resort if you didnt want to.